For many people, the French twist is the go-to hairstyle for any formal event or occasion that calls for an updo. This hairstyle has been used for centuries – some claim it was even popular in Ancient Greece! There are a lot of variations you can do on the French twist, so have a look and see which one is your favorite. This is the hairstyle that most people picture when they think of French twists. You can get this look by brushing your hair into a ponytail and twisting it so that it forms a sort of roll on your head. Secure the hair in place with bobby pins in a color that matches your hair. Set it with extra-hold hairspray! 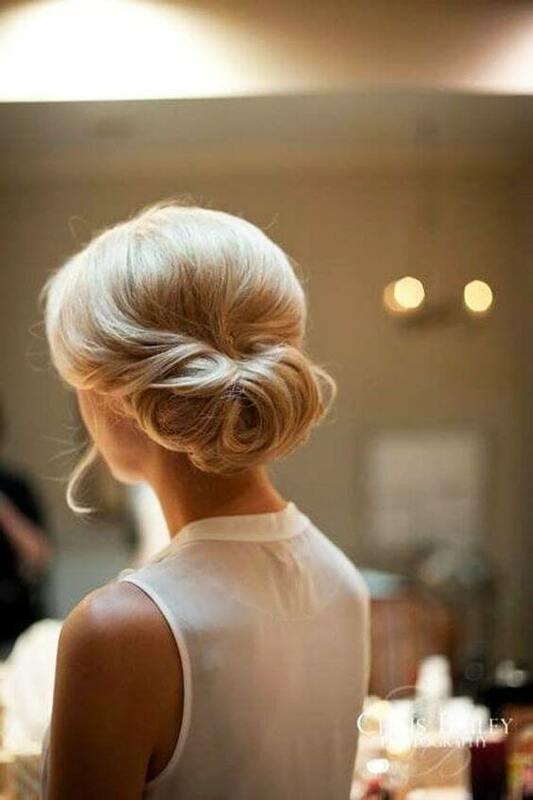 This hairstyle would be lovely for any special occasion. To recreate it, make sure you are working with a sleek, blowdried base. Lightly backcomb the top of the hair to create volume and shape, and carefully twist the bottom into a delicate roll, using different sections of hair at a time. You can create a French twist style on hair with any texture. It is not only stylish but also a great protective hairstyle. If you have Afro texture hair, you can do this look at home. It’s a fantastic look – we’ve seen this style on many celebrities, like Janelle Monae. If your dress or outfit has got a vintage feel to it, pair it with this retro-inspired updo. You may need to use a foam hair roll to get volume – it’s much easier on your hair than backcombing. The twist culminates in a gorgeous swirl at top and is accentuated with rhinestone hair pins. Combine two timeless looks to get this French twist pompadour updo. Make your twist using a ponytail taken from the right side of your head while backcombing the left side to create a voluminous bouffant. The result is formal, but not overly fancy. This hairstyle looks deceivingly complicated, but really you only have to create a standard, simple braid and a simple French twist. Leave out a couple inches of hair from your French twist to create the braid. After rolling your hair and pinning it in place, braid your loose hair. After securing with a hair tie, place the braid over the edges of your French twist. Think of this style as the French-twist dressed down. It’s fun, light, and a lot more casual than other twisted updos. If your hair isn’t already wavy, creating loose curls with a curling or flat iron will give you the texture that really makes this look. This is a look for anyone who loves boho style or just wants to incorporate a bit of nature into their look. Pin your French twist up with flowers, herbs, leaves, or any other nature-inspired adornment. Volume is the name of the game with this innovative faux-hawk updo. After blow drying, back combing, and generously coating with hairspray, take sections a couple inches wide and start to pin in a roll shape. The sections don’t have to be the same width— that’s what makes this hairstyle eye-catching. This style is similar to the braided updo we saw previously but is using a horizontal twist instead. This intricate hairstyle brings a braid from the left to the right side of the head, tucked into a neat French roll. You could wear this with both a casual or formal outfit. If you are looking for inspiration for wedding, bridesmaid, or prom hairstyles, consider this It’s wavy updo. It features carefully positioned curls and a side part resulting in a very feminine, sophisticated look. This is a great hairstyle if you have shorter hair. Recreate this vertical twist by dividing your hair into three sections— a small front section on each side of your face, a top section, and a bottom section. Curl the face-framing sections at the tips with a small iron. Then, start twisting and pinning the top later and later the bottom later to get that vertical twist effect. You can always adorn your French twist with any kind of pins or barrettes you have at home. Whether they are stick pins, claw clips, or combs, they will look extremely elegant with a French twist. This silver comb goes well with this loose updo. Shake things up with an asymmetrical twist design. By combining a small bouffant and a curved twist you can get a new unique shape for your updo. This style is great for showing off any earrings or accessories you may have, as it’s neat and clean. This is a very sweet style that would be a fantastic addition to any prom dress or formal outfit. It has a vintage charm reminiscent of old Hollywood film stars of the 1960’s. The beehive style creates a very sleek and smooth finish. Brigitte Bardot would approve! If you’re a natural girl, try this take on the French Twist. Instead of using braids, twist individual sections of hair to get this incredible hairstyle. It’s a perfect style for when you want to look your best and protect your ends. Looking for a hairstyle that’s extremely polished? With the right tools, you could create a stunning vintage hairstyle like this one. You’ll need a large foam hair roll that you’ll pin your hair over to get that volume. Then, you’ll need to take a curling iron to the front section of your hair and pin it to the U-shape. A fusion of braids and French twist is the perfect in-between hairstyle if you’re getting bored with growing out your hair. Doing different updos are a great way to protect and maintain your hair during a long growth process. This particular updo isn’t overly formal, so you could wear it anywhere, even to the gym! Be the envy of everyone with this creative twisted hairstyle. This look will dress up any outfit! When creating the twist, leave out the section of hair surrounding your forehead. After you’ve finished twisting, tuck the hair you’ve left out of the twist into a fantastic pompadour. Sometimes you just don’t want to put all of your hair up, and that’s okay! Let your hair down (partially) and pin the sides up in a fashionable french twist. To pull the look together, curl the remaining hair with a large-barrel curling iron to get the loose waves in the photo. Whether you’re dressing up for a costume or putting together an outfit that will stand out in a crowd, this vintage-inspired hairstyle won’t disappoint. Twist your hair as you would for any French twist, but keep things very loose. Fashion the top end of the twist into a large circle and secure with pins and hairspray. Add a small bouffant at the top if you like. If you’ve ever wanted to feel like you’ve just walked off the set of Mad Men, this is the hairstyle for you. You’ll be using three different sections of hair to create two twists and one beehive. The bottom section will be twisted inwards, the second section will be used to create a large beehive that ends in a twist, and the third section will be used as bangs shaped in an elegant roll. Unlike most French twists, you don’t need to have a lot of length to get this hairstyle. You will, however, need plenty of bobby pins! Take all of your hair and carefully pin it in a roll to one side. Some hair will fall out, but that’s fine! That’s what makes this style look messy-chic. For a fantastic formal look, gather roll all of your hair into a horizontal roll except for two small sections on either side of your head. After pinning the roll, cross the two think sections over each other and pin accordingly.